Those are words that describe the way Naaman felt when Elisha told him how to be healed of leprosy. I am captivated by his response because there is something else here, simmering beneath the surface. I love when my Bible reading sends me meandering down roads of thought I have never taken before. Often when I set out writing about these thought journeys, I do not know where they will end. Have you ever been so tormented and upset about something in your life that you can’t sort out how you really feel, much less think, about the situation? When I’m mired and muddled in this way, writing is a balm to my soul and helps bring me back to the eternal truths on which my faith in the Lord rests. When I see Naaman standing there at Elisha’s door, he’s rigid with apprehension. First he learned from a young girl that healing may be possible from a certain prophet in Samaria. Rather than directly sending him to the prophet, his king sent him on to the King of Israel with a letter of introduction and some very pricey gifts. So Naaman’s “primary care physician” — the King of Israel — sent, or “referred,” Naaman on to Elisha. However, Naaman experienced even more angst when he got Elisha’s messenger instead of the man himself! Have you ever made an appointment you thought was with a renowned doctor — far away from your home — and instead ended up seeing the nurse practitioner? I would be perturbed, if not outright offended, if that happened to me. Yet that is exactly what Naaman experienced! What exactly is leprocy? 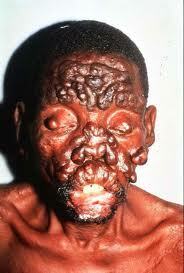 Now we know that leprosy is a bacterial disease. Untreated, it leads to disfigurement in the form of nodules that form over the skin, nerve damage, and muscle weakness. The Bible does not say how severe Naaman’s case of leprosy was, but we can assume that it was bad enough for his king to send him for some help. It did not interfere with his duties as a military commander, so perhaps he did not yet have muscle weakness. I can only imagine the fear Naaman must have had for his own life after having seen the progression of the disease in others. I can imagine Naaman might have felt some apprehension mixed with hope when he reached out and knocked on Elisha’s door. Maybe now this prophet would come out and heal him. Instead of seeing Elisha, however, Naaman got the messenger. After traveling all the way to Samaria, he got the messenger, not the man. He also received a prescription relayed by the messenger that, to him, was as bizarre as it was insulting — he was told to go take a bath seven times in the Jordan River. Take a bath?? And what was so special about the Jordan? The King James version of the Bible says that at this point, Naaman wasn’t just mad…he was “full of wroth.” Don’t you just love the way those words reflect their meaning? So Naaman went down to the Jordan River and dipped himself seven times, as the man of God had instructed him. And his skin became as healthy as the skin of a young child’s, and he was healed! Not only was Naaman healed of his debilitating disease, but he also became a believer in the Lord! This healing was so profound that Naaman packed earth from the area in order to build an alter to the Lord after he got back home. When I compare my journey to Naaman’s, I am still on my way. I know my healer is Jesus. I have knocked on His door. Like Naaman, I have not seen my healer’s face. I haven’t yet heard his prescription for my healing. But I’ve asked, and I know that I will receive. Already I can tell that reducing stress in my life reduces my pain and odd symptoms. And I have felt a prompting to contact a specific doctor…I don’t know why I am holding back on this step. Is the inner prompting from God? Or is it arising from my desperate attempt to grasp at anything that may give me answers and relief? I’ve recently been burned by a nurse practitioner I thought was going to help me use bioidentical hormones to help manage my symptoms. This person did not accept insurance, so I paid out of pocket for some very expensive tests…and have yet to receive the results. Somewhere there is a lesson in here for me — putting my faith in the Lord and not in test results, perhaps? Or not doing business with practitioners that do not accept insurance? Or maybe it’s just learning how to be patient with my condition? I do know that one day Naaman’s story will be my own. I can only pray that I will not be full of wroth as I wait!